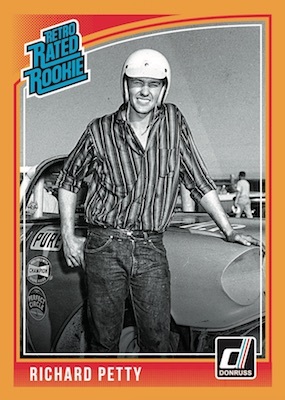 Walking the line between the collecting past and present, 2019 Donruss Racing NASCAR features retro looks, throwback designs and modern technologies under one affordable roof. The fundamentals are similar to the 2018 set, and each Hobby box specifies an average of one autograph and two relics. However, the pack size decreases to eight cards in 2019 from 10 in 2018. 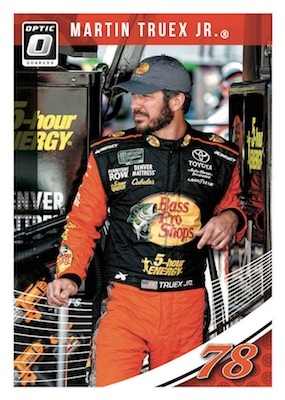 Headlined by options for cars, legends and stars, 2019 Donruss Racing NASCAR displays the familiar simplicity of the brand. Giving more legs to the Rated Rookie subset, the Retro Rated Rookie cards are a nod to the all-time greats of the track. 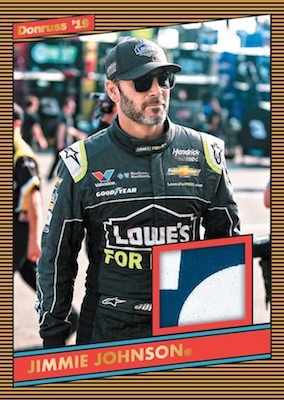 In addition to the base set, the 2019 Donruss Racing NASCAR checklist offers the new Donruss Optic Racing cards. These average one per pack, as do the various parallels and inserts. Among the insert choices, Race Kings highlights NASCAR's finest using an artistic style. 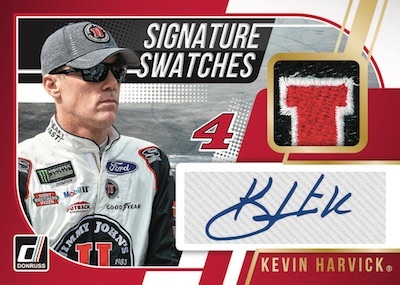 With one autograph and two memorabilia cards per Hobby box, collectors can expect three hits in 2019 Donruss Racing NASCAR. As for the autographs, Signature Series covers the current stars and young talent, while Limited Spotlight Signatures sticks with budding superstars. Adding in race-used gear, Signature Swatches combines an autograph and swatch for a top driver. Finally, memorabilia inserts include Race Day Relics and the 20-card 1986 Retro Relics set, which borrows the design from the '86 baseball release. DALE EARNHARDT JR - 2019 DONRUSS RACING REFRACTOR AUTO AUTOGRAPH #’d 75!! 2019 Donruss Racing NASCAR Signature Swatches Auto #SS-JR Dale Earnhardt Jr. PARALLEL CARDS: Silver, Gold #/299, Black #/199, Gold Press Proof #/99, Press Proof #/49, Artist Proof #/25, Printing Plates 1/1. PARALLEL CARDS: Holo, Blue Pulsar, Red Wave, Gold #/10, Gold Vinyl 1/1. 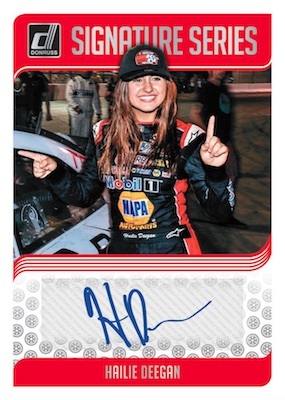 Buy 2019 Donruss Racing autographs on eBay. PARALLEL CARDS: Red #/99 or less, Holo Gold #/25, Holo Black #/10. PARALELL CARDS: Gold Vinyl 1/1. PARALLEL CARDS: Red #/250 or less, Holo Gold #/25 (Ryan Reed #/5*), Holo Black #/10 (Ryan Reed 1/1*). PARALELL CARDS: Red #/50 or less, Holo Gold #/25 or #/10, Holo Black #/10 or less. PARALLEL CARDS: Red #/250 or less, Holo Gold #/25, Holo Black #/10. PARALLEL CARDS: Red #/185, Holo Gold #/25, Holo Black #/10. PARALLEL CARDS: Holographic, Cracked Ice #/25, Xplosion #/10. View the 2019 Donruss Racing NASCAR checklist spreadsheet. Nice set of Cards! Huge NASCAR Fan here. I do have a statement. I pulled a Terry Labonte Race Kings card that is an Error. Silver Lettering and on the back bottom there is no Team name and it is just blank white. When will those type of cards be published? I got all 175 cards in the set. nice cards. lots of optics 2 race day relics and 1 signature autograph. a decent number of inserts but overall the most optics/inserts were pretty common. not a bad selection for the price I paid.